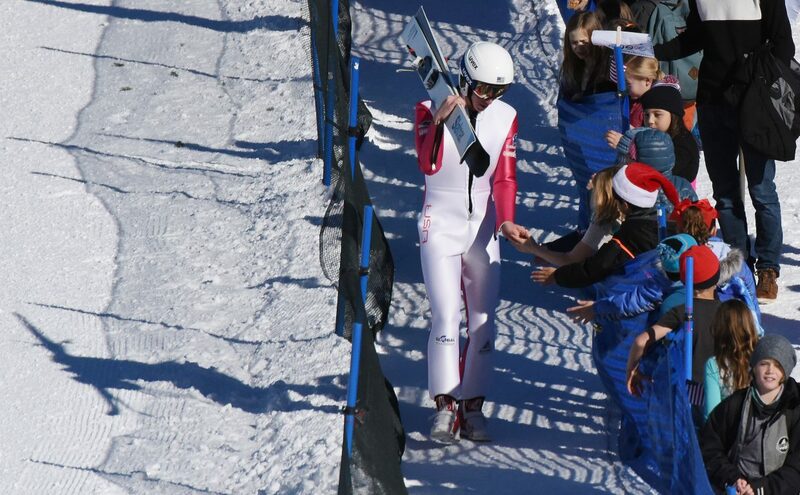 Steamboat Springs skier Ben Berend high fives children at the bottom of the jump at the Continental Cup in Steamboat Springs. Jasper Good looks uphill after his jump Friday at Howelsen Hill in the Continental Cup in Steamboat Springs. Canada's Nathaniel Mah flies off Howelsen Hill on Friday during the Continental Cup in Steamboat Springs. 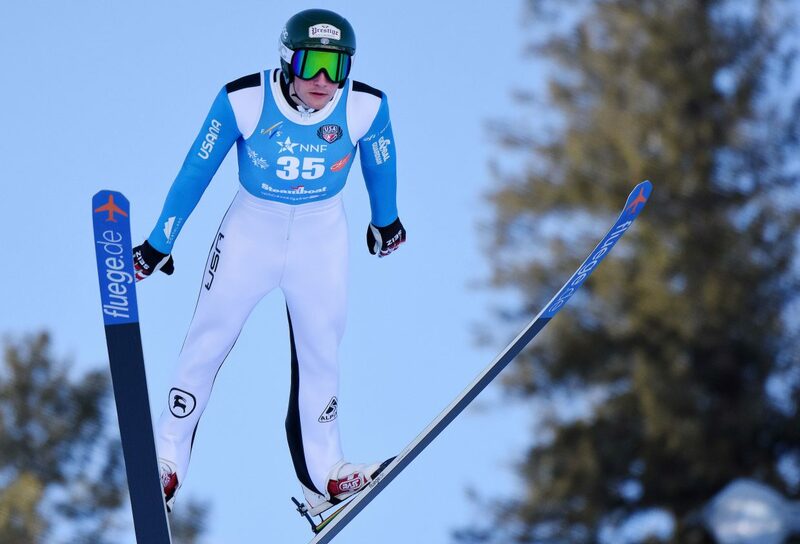 Jasper Good flies Friday in the Continental Cup in Steamboat Springs. Ben Loomis, a Wisconsin native and a member of the U.S. Nordic Combined Ski Team, flies through the air Friday at Howelsen Hill during the Continental Cup in Steamboat Springs. 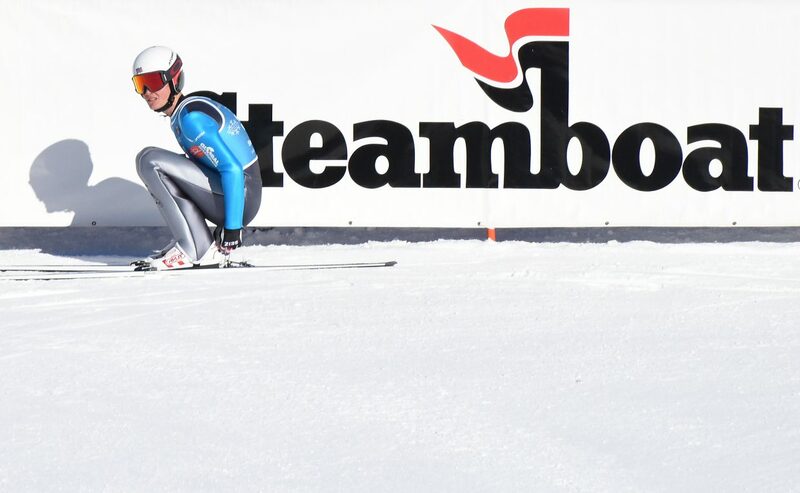 Ben Berend competes Friday in the Continental Cup in Steamboat Springs. Howelsen Hill reflects in the goggles of U.S. skier Stephen Schumann on Friday at the Continental Cup in Steamboat Springs. Norway’s Mikko Kokslien was first, his teammate Truls Soenstehagen Johansen second and France’s Hugo Buffard third on Friday at the Continental Cup in Steamboat Springs. Mikko Kokslien flies off the HS75 jump hill at Howelsen Hill in Steamboat Springs on Friday during a Continental Cup Nordic combined event. Norway’s Mikko Kokslien, left, surges toward the finish line Friday just ahead of teammate Truls Soenstehagen Johansen on Friday in a Continental Cup Nordic combined event in Steamboat Springs. Kokslien finished the race in first with Johansen in second. Jasper Good, center, and Ben Loomis, right, catch their breath Friday after the Continental Cup Nordic combined race in Steamboat Springs. 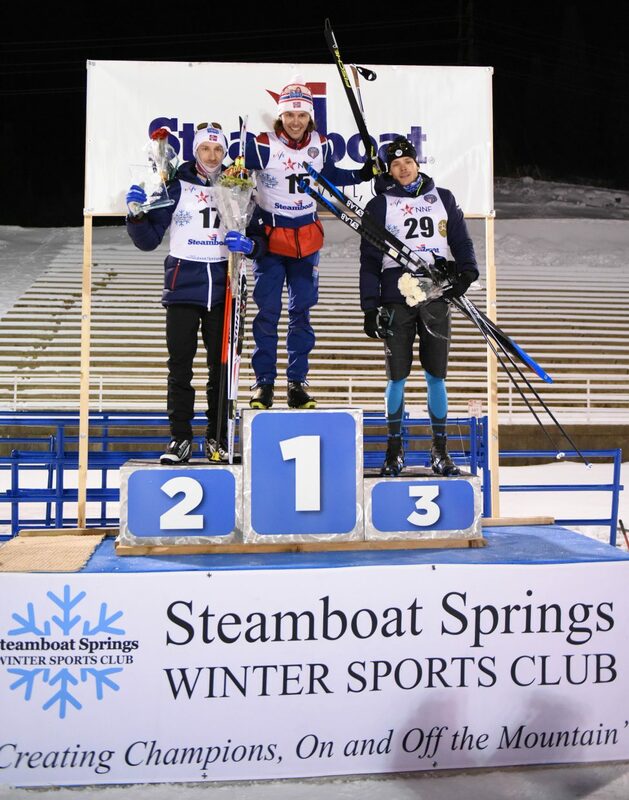 Ben Berend catches his breath after Friday’s Continental Cup Nordic combined race in Steamboat Springs. 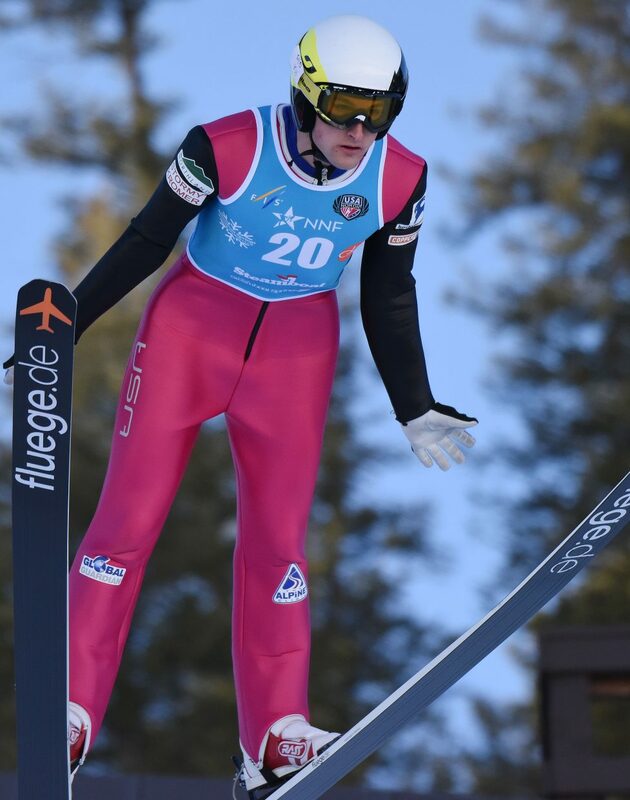 Grant Andrews, a Steamboat Springs and U.S. team Nordic combined athlete, looks for his landing Friday at the Continental Cup in Steamboat Springs. 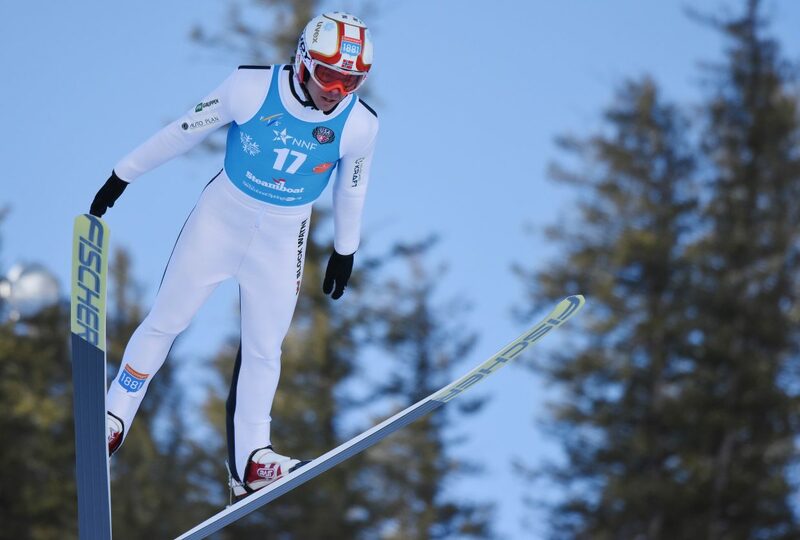 STEAMBOAT SPRINGS — Mikko Kokslien hadn’t ever raced a Nordic combined Continental Cup heading into Friday’s race in Steamboat Springs, and not because the Norwegian skier is a wide-eyed, knees-knocking rookie. 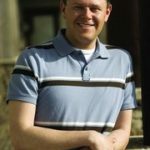 He’s anything but, actually, and when the thoroughly experienced 32-year-old, who’s logged more than a decade on the World Cup, dropped down to the Nordic combined minor leagues Friday, he put all that experience to work. 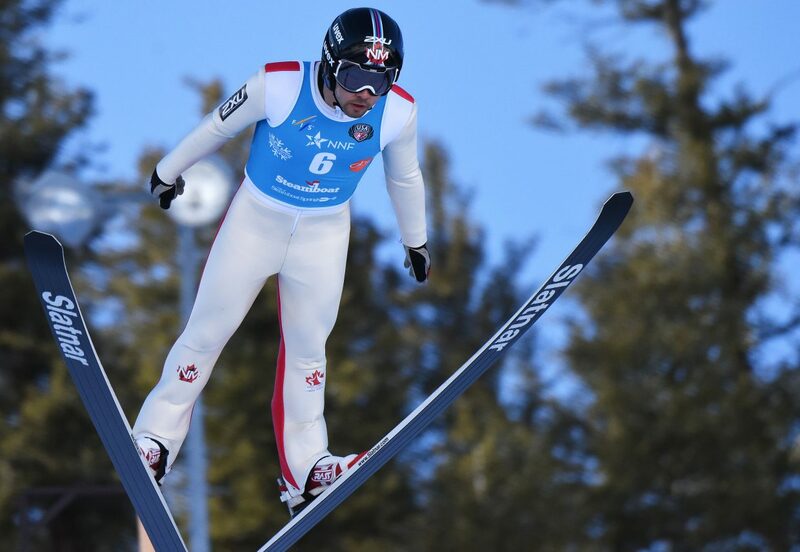 Kokslien skied up from his 15th-place jump to win Friday’s Continental Cup event, charging into the finish corral in Romick Rodeo Arena 0.6 seconds ahead of teammate Truls Soenstehagen Johansen. Hugo Buffard of France laid down one of the day’s best skiing performances to place third. 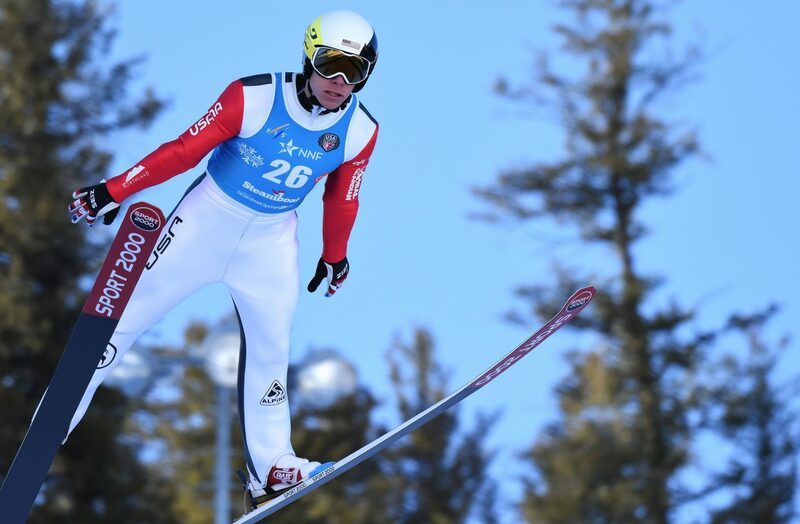 “I had a tough start is Kuusamo (Finland) and Lillehammer (Norway), and I’m trying to build up the self-confidence,” Kokslien said of his stop in Steamboat. About that feeling of getting back on the podium? He’s had plenty of experience dominating at the sport’s highest level. He has three Olympic event starts over two Olympics. He’s started at five different World Championships and collected five medals there. The only reason he’d never raced a Continental Cup before Friday? Back when Kokslien raced at that level, one step below the World Cup, it was called World Cup B instead of Continental Cup. He raced there plenty, including in Steamboat in 2005, but it’s been all World Cups since 2008. Friday, he made quick work of what he termed an easy 10-kilometer cross-country ski course. Two steep stretches stand out on the course, but otherwise it was a flat run around the base of Howelsen Hill for the day’s racers, five laps with the start and finish in Romick Rodeo Arena. Often, hills are the place to make a move, but the Norwegians tried an opposite approach Friday. He skied up from 17th place with a strategy that was pretty simple: find his veteran teammate, Kokslien, and follow along as well as possible. Buffard, meanwhile, skied up from 29th place to land on the podium. It was a strong day for several U.S. skiers, as well, especially Wisconsin’s Ben Loomis. 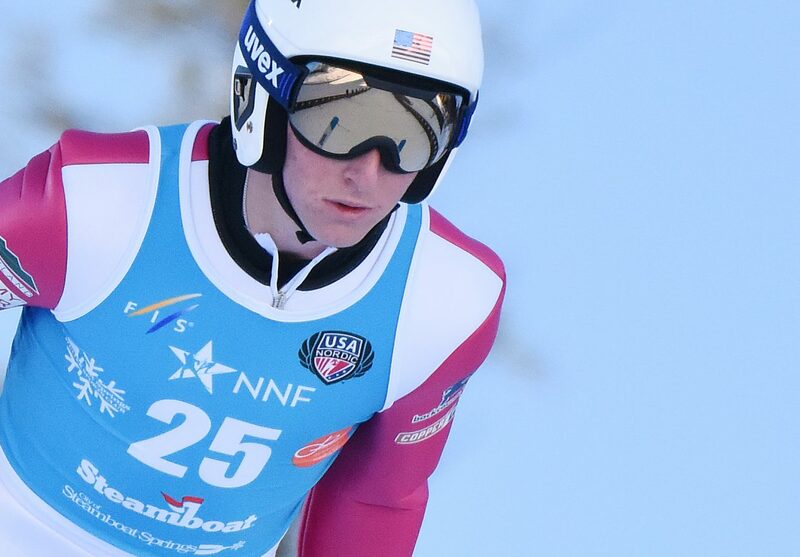 Loomis, a member of the U.S. Nordic Combined Ski Team, opened the day with a huge jump of Howelsen’s HS75 jump, flying into second place. He stuck with the lead pack through much of the race and ended up fifth, one of the best results of his career. It was his fifth appearance in a Continental Cup top five. Steamboat racer Jasper Good also was strong. 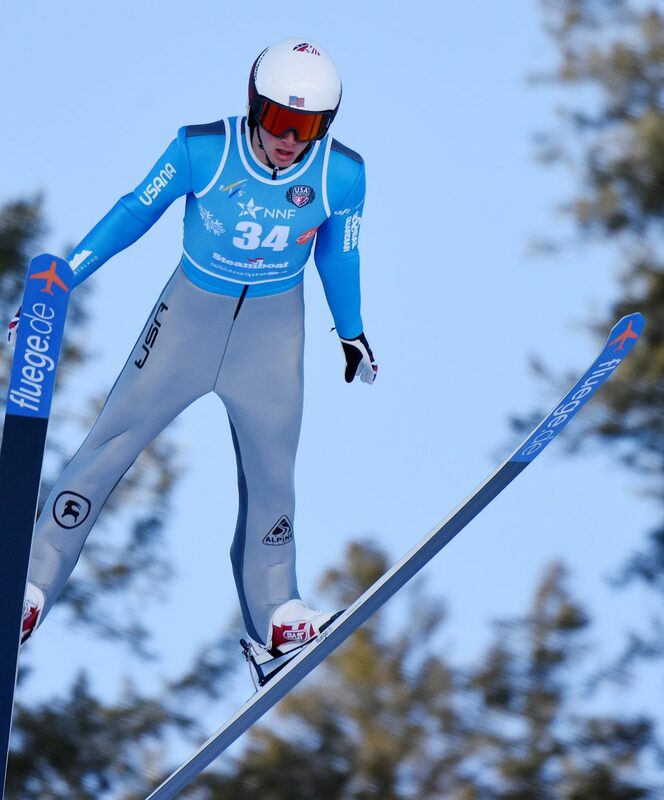 He turned a 12th-place ski jump into a 10th-place finish. 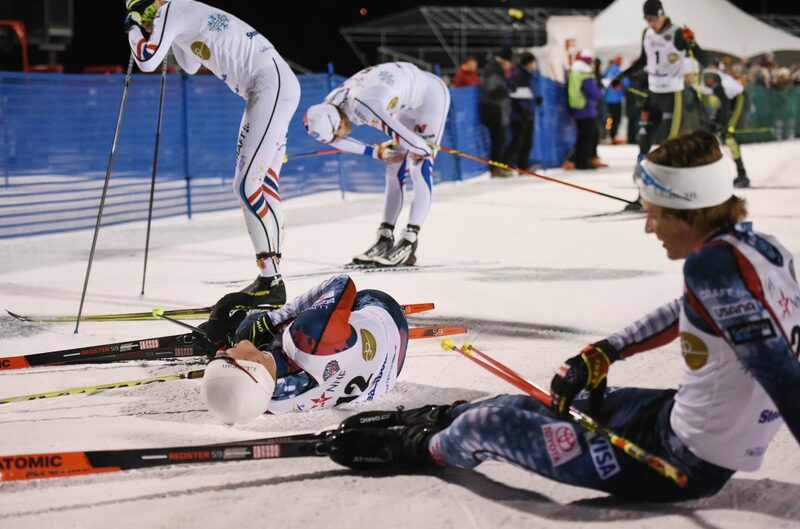 He broke a ski pole midway through the fourth of the day’s five ski laps, which he said cost him valuable energy, but that didn’t stop him from recording just the second top-10 finish of his career. Elsewhere for the U.S., Stephen Schumann was 16th, Ben Berend 18th, Jared Shumate 30th, Grant Andrews 36th and Tucker Hoefler 42nd. 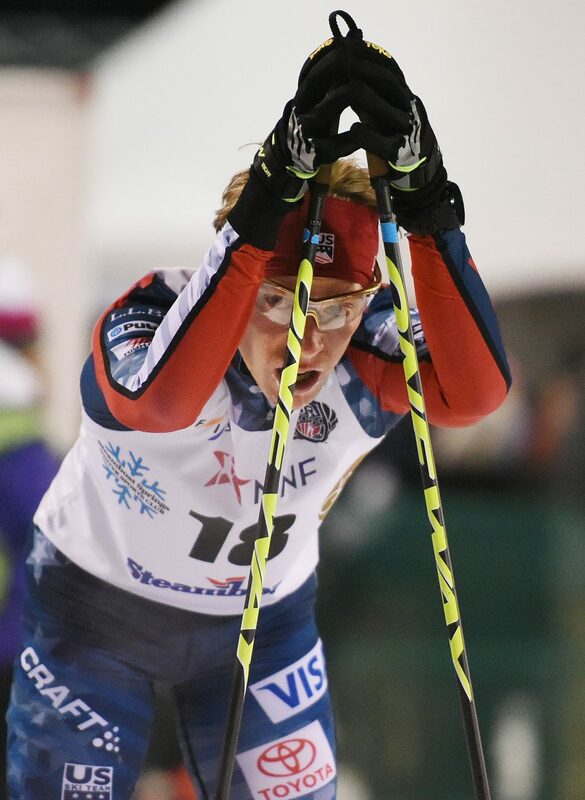 The action resumes at 10:30 a.m. Saturday at Howelsen Hill with the second of three days of Nordic combined.